If you’re searching for something to feature in your décor that’s one-of-a-kind—really, truly one-of-a-kind—look no further than a vintage sign. Each sign has its brand of patina, rusted spots and worn areas that won’t quite match another sign in the world. And that’s a distinctiveness that makes décor shine. It’s fascinating to think about the fact that each vintage sign has its own story and history, a whole life before you came along and found it. Perhaps it hung proudly in a business or factory for decades. Maybe it’s advertising a long bygone product. Or it’s a street sign that once resided in a beautiful neighborhood. By bringing them into your home, you can give these signs a second chance by having them live out a new purpose. Authentic, good-condition vintage signs can be found in several places. Flea markets will be your best bet and will increase the likelihood that the signs are the real deal. Etsy is another excellent destination—search for signs in the vintage section. And you’ll also discover them at antique stores, of course. These days, with the farmhouse trend in high demand, vintage signs can be expensive at times. Vendors price signs this way because they know they have one-off items that can’t be purchased at a big-box store. Since a sign is a distinctive and straightforward way to anchor a space, think of it as an investment purchase, and expect to spend anywhere from $40 for small signs to thousands of dollars for particularly rare varieties. Whatever your budget, diminutive or large, chippy or like-new, a vintage sign is a surefire way to elevate the uniqueness of your home’s décor. And here are 10 bloggers, Instagrammers and interior designers who are doing just that. A vintage sign has this power to be nearly the only thing you need to shape a room. If it’s large enough, it won’t be a conversation piece—it’ll be the conversation piece, eliminating the need to fuss or work in other design elements. 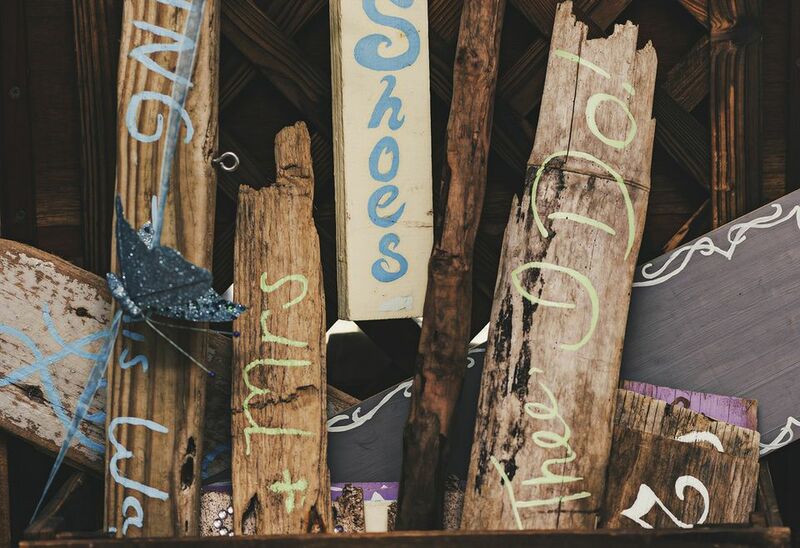 It can stand on its own, like this Farm Market sign that serves as the hub of the room. Many vintage signs are rendered in bright colors, like this “Hall of Fame” sign that provides a shot of green to an otherwise predominantly neutral room. Look for signs that advertise products—they typically have the most attention-grabbing hues. A metal, industrial sign can surprisingly play very nicely alongside elegant, glamorous décor, as seen here. The vintage factory sign is hung within eyeshot of a glitzy crystal chandelier, and the dichotomy makes the corner that much more interesting. It’s fun to hang signs that express a sense of humor in a particular space in your home. Perhaps an arrow can point upwards toward the stairs, or an Exit sign can be hung above the door. In this bathroom, an “Employees Must Wash Hands” sign is displayed next to the sink, offering a tongue-in-cheek touch. Gallery walls are even more noteworthy when they spotlight objects and textures that go beyond basic framed pictures. This is an especially artful gallery wall, and the black and white “Central Ave.” street sign makes it all come together. A vintage sign can be a graphic accent to include in a gallery wall, and it also has text that invites the eye to linger. Standard shelves lined with kitchen essentials are made a lot more engaging with the addition of a rusted vintage sign showcasing that perfect patina. It’s just that little extra something that some shelves need, whether they’re filled with beloved books or small, decorative objects. We all have these random, "what do I do with this?" wall spaces in our homes that can be total head-scratchers. "What can go here?" You may think. A vintage sign might end up being exactly what you need. It’s visually appealing, and many are odd sizes that can fit in unexpected places, like above a landing on your stairs. You have your favorite tchotchkes, the ones that grace tabletops and shelves alike. Alongside your potted plants, vintage letters, framed artwork, and other items, why not also feature an old sign? This Robb Restyle image depicts this idea beautifully. Who says a home office isn’t a place for happy, charming décor? A vintage sign can add a certain breeziness to a workspace, proven here with this “Recommend for Adults” sign that gleefully hangs above the desk. Vintage signs can sometimes be big. 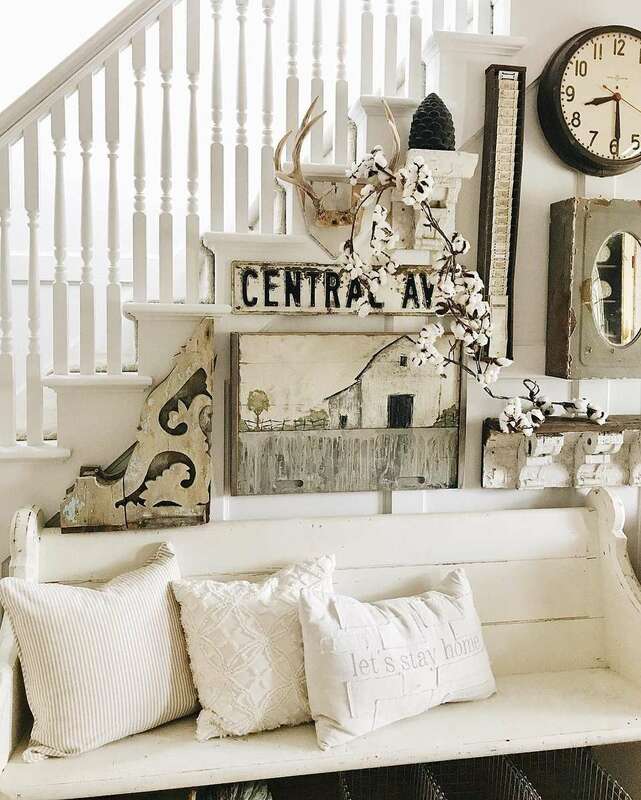 If it hung on a storefront, the odds are that it’s a large-scale piece, but one that you shouldn’t shy away from incorporating into your décor, as shown by Simple Things Blog. It’s the ideal thing to occupy the space above the vintage drawers and chairs, and we do not doubt that each guest asks to know its story.